The University of Wisconsin-Stout is conducting research on Ss1 bacterium in honey bees and varroa mites. The goal of this effort is to recruit beekeepers in all 50 US states that will provide samples of analysis of Ss1 bacterium. The name of the program is Initiative for Nationwide Detection of Ss1 (INDES). 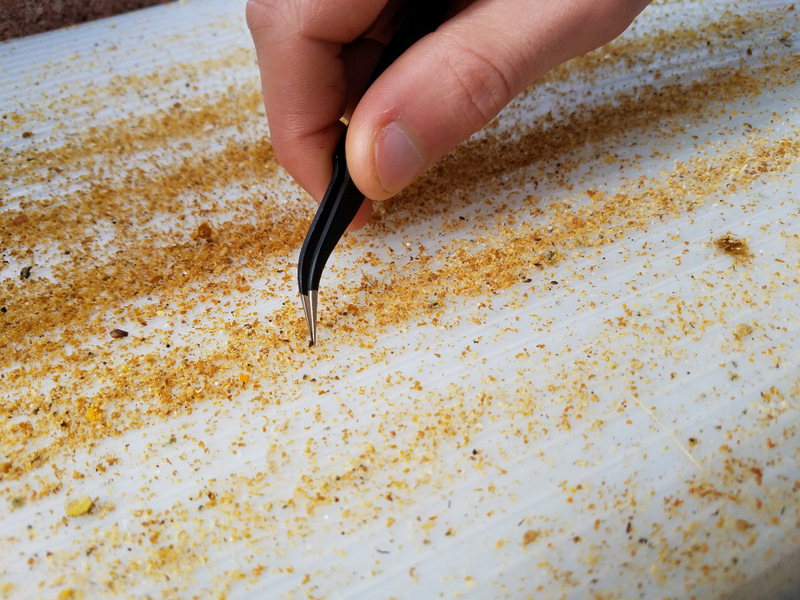 BeeManiacs collected dead mite samples following UW-Stout protocols and mailed the samples last March, contributing information from Eastern Washington State. UW-Stout studies led to the discovery and reporting in 2016 of Serratia marcescens strain sicaria (Ss1) bacterium, a potential new threat to hives. Much of the work has been done by students at UW-Stout lab. The goal of the INDES effort is to obtain samples of Varroa destructor mites and honey bees that will allow to better identify locations where the Ss1 bacterium is found. A clearer understanding of the bacterium’s location will provide more information about its potential impact on bee health. You can see below some pictures of our mite collection for this program and also some links for more information about Ss1 bacterium. Please visit the respective links for more information and pictures for each option. We are doing the “package in a nuc” and the “starter hive” for the first time this year. We only made ten of each, as a test, and if everything works well, we will make more in future seasons. As we write this, we are sitting at Olivarez Honey Bees in California, waiting to load the packages and bring them to BeeManiacs. 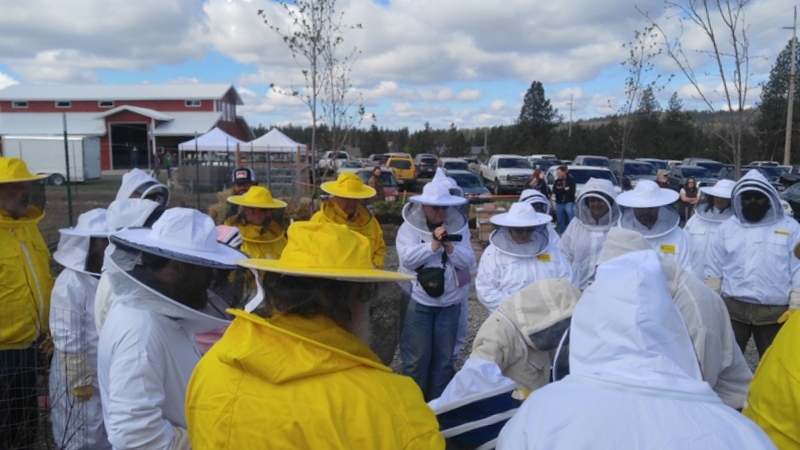 Pickup date for the packages at BeeManiacs is April 28, rain or shine. Bees in a package are very vulnerable and have a limited capability to regulate temperature and air flow. They depend on the beekeeper to provide the right environment during transport. Once you have your package/s, we recommend you to go to your bee yard and install the bees as soon as possible. We do not recommend transporting packages on the back of pick up trucks. There could be too much airflow (cold air) or could be exposed to too much sun or even rain. Car trunks are not a good idea either, because they could get too hot and lack ventilation. It would be better for the bees to ride in the vehicle with the beekeeper with average or “room” temperatures. The longer the trip home, the more important it is to provide the right travel environment. Just transport the package/s as you would a pet. Don’t leave the package inside a car (it could get too hot or too cold). If you bring someone along for the ride, make sure they are comfortable with sharing the car with thousands of bees. It may be a good idea to bring a veil or any protective gear, just in case. Try to install the package later in the day, to prevent robbing from existing colonies and reduce chances of absconding. Get the hive set up and ready to receive the bees ahead of time. Take into account that the package is installed in one single box. If you bought a hive kit with multiple boxes, just use the first one. If you have a non-conventional hive, like top-bar, horizontal or AZ Slovenian hive, please note that you have to use follower boards or some kind of divider to make the chamber where the package is installed smaller. You will need to feed the bees with sugar syrup (mix of granulated sugar and water 1:1) so make sure to have enough sugar and a feeder to deliver the syrup close to the bees. A package that is installed correctly will start drawing out comb, have brood, and expand for the rest of the season. If there’s something wrong with the queen or the colony, we have about 7 to 10 days to solve the problem. But when the conditions for the package are bad, all the bees could die within three days, without having a chance of establishing the colony (for example due to lack of syrup feed or if installed in a hive that is too big or has too many boxes). When you pick up your package at BeeManiacs, we will give you detailed printed instructions to follow when you install them at home. In the case you run into any problems, email us at livebees@beemaniacs.com as soon as possible. In many cases, we can help you resolve most problems, as long as we’re contacted right away within the first week. We were able to increase the quantity of Saskatraz packages we are bringing this Saturday, April 28. We will continue taking orders, while supplies last, on a first come, first served basis. Friday and Saturday (April 27 and 28) we will only take orders in person at our store. Online orders won’t be available from Friday on, even if we have packages left. If you pre-ordered packages or materials that are ready to pick up on April 28, please read on. Pick up hours are from 9:00 am to 3:00 pm. Our store opens from 8:00 am to 4:00 pm on Bee Day. Proceed to park in our parking lot. Please park close to other vehicles to make sure we have room for everybody. If you want to purchase something from our store or visit vendors and the beekeeping swap meet, please do that first. Once you are ready to pick up your packages or pre-ordered material, please go to the store entrance (marked “1” in the diagram below) and there will be a desk where you can receive your printed invoice with pick up vouchers. 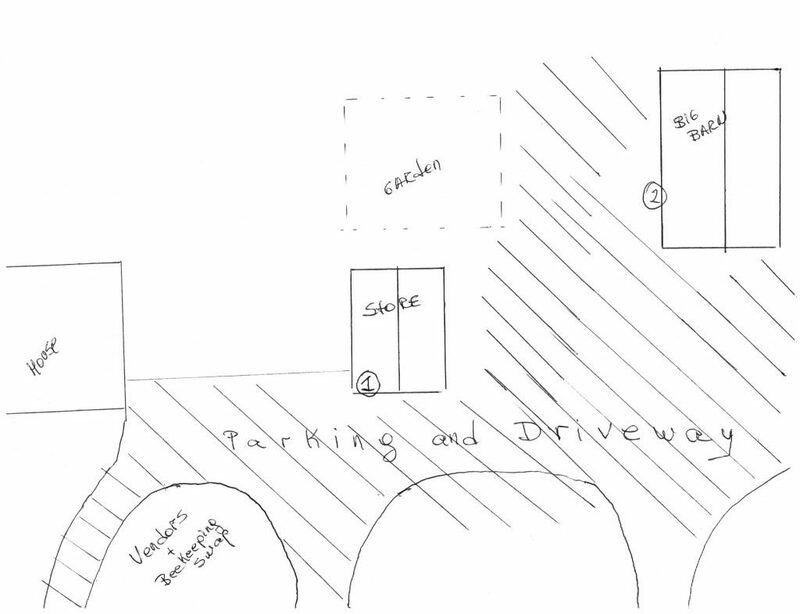 You can now go to the pickup area (the big barn), marked as “2” in the diagram and pick up your order/packages. Once you’ve collected your bee package, we recommend going straight home and installing them as soon as possible. Planning on buying equipment on April 28? Please read on. Bee Day is usually a busy day. If you are just picking up pre-ordered package/s, you could do it quickly. You will first get a printed copy of your invoice with a voucher to get the package/s and just pick up the packages whenever you are ready. That simple and pretty fast (we will send more details in another email). But for beekeepers purchasing material in the store, in 2017 we experienced long lines of up to 2 hours to get through the checkout process. We have implemented many improvements for 2018, hoping to speed up the process as much as possible. For local beekeepers, we still recommend purchasing and picking up all of your beekeeping equipment before April 28. So you will just need to pick up bees that day. But we have some beekeepers coming from the Seattle area and central Montana (about an 8-hour drive). Since they come from far away, they will be purchasing some items on that very same day. The deadline for placing an order online that will be ready to pick up on bee day, is Monday, April 23. All online orders received by April 23 will be confirmed and will be ready to pick up on April 28. We will have your material packed and ready to pick up right next to the bees (no need to go through checkout in the store). We have also improved our checkout system, so we can process multiple orders in parallel (we used to have a single register). We hope that all the improvements we made will provide a better experience for all of our visitors that day. If you ordered packages from us, you should have received an email on April 5 confirming pick up date for April 28, from 9:00 am to 3:00. This was our original scheduled date and the supplier is able to deliver on time. The nucs from Old Sol should also arrive on time (May 19), but we will email confirmation by the end of April. If you ordered packages from us and you did not receive an email confirmation, please contact us at livebees@beemaniacs.com. We need to make sure you can receive our emails. We will also verify that you do have an active over with us. For several years we had many more items in our brick and mortar store than in our online store. That was a source of frustration, for not being able to sell online material we already carried in the store. We have set up a new online store system and we’re currently in the process of adding items to the online store. We open for the season on Friday, February 16, and our goal is to have all items posted in the online store by then. Once we add the products online, beekeepers that are not in driving distance will be able to place orders with us. We will be shipping most items. But there is a benefit for local customers too. From now on, you can place an order online and select “pick up at the store” during checkout. We will set the material aside and let you know once it’s ready to pick up. This will speed up your purchasing process. You are more than welcomed to stay as long as you want, have a coffee and talk bees with us. But if you are in a hurry, you can just pick the order up and keep going. We have 125+ items online now and will keep adding until we have everything online! We receive many emails a day with beekeeping related questions. It’s sometimes hard for BeeManiacs staff to stay on top of answering emails and in some cases, we end up answering the same or similar questions multiple times in one-on-one emails. We had to find a more efficient way to bring the information to more beekeepers. After evaluating different options, we decided to set up our own online forum system, so we can share our answers in a public environment, where the information will reach more beekeepers. One of the reasons we decided to set up our own forum in our website was because the existing systems or the social media options out there (i.e. Facebook groups) are not accessible to everyone, and certainly not friendly on a regular basis. 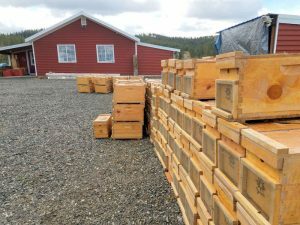 There is a lot of information out there that is not accurate and the biggest public forums are hard to read, with input from many beekeepers from different countries (based on different equipment or weather). 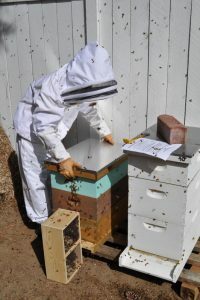 The BeeManiacs forum welcomes new beekeepers as well as experienced ones. There are no “dumb” or “too basic” questions. Beekeepers should feel free to ask any questions, knowing that they will receive one or more answers with different opinions, but in a friendly fashion. 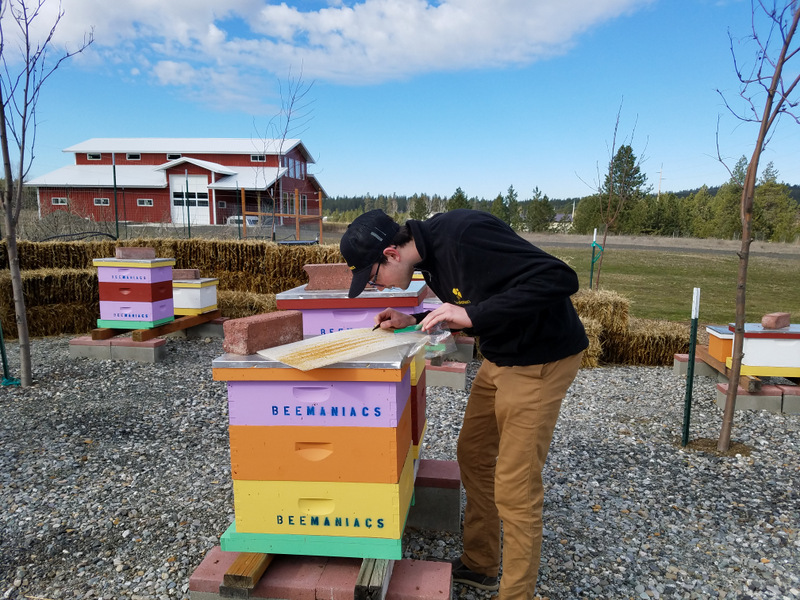 Our forums are intended to support students from our online courses and in-person classes that we volunteer to teach in the Inland Northwest of the USA, as well as BeeManiacs store customers and beekeepers in general. 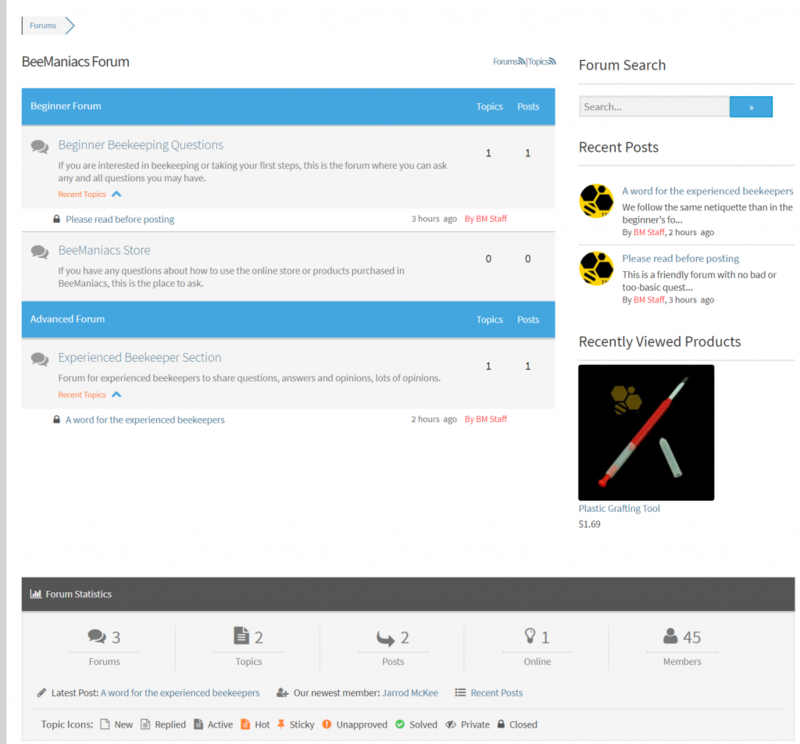 If you bought a tool or equipment from us and would like to ask how to set it up or use it, try going to our forums first. Anyone can search information in the forum, but to post a question, you need to be a registered member and log in to your account. If you purchased something from us, you probably created an account and just need to log in. Once you are logged in, feel free to post any question. In 2017 we did not have enough bees to cover the demand, so for 2018 we’re almost doubling the number of bees we will supply. We will have two waves, with packages arriving in April and nucs in May. We are teaming up again in 2018 with Olivarez Honey Bees from California. Olivarez is a reputable supplier of high-quality queens and packages. This year the packages will have marked queens (unless extreme weather during queen rearing process occurs). They will include the usual queen race options, Italian and Carniolan, but this year we will have a new option: Saskatraz packages. Saskatraz queens were developed in Canada (you can visit their website at this link) and Olivarez Honey Bees is the Saskatraz hybrid producer for North America. We are looking forward to seeing how this Canadian hybrid performs in the Inland Northwest. It sounds promising! 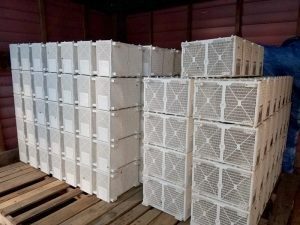 We are bringing Old Sol nucs again since their customers keep asking us to bring these Oregon nucs to our area. Many beekeepers are pretty happy with the results from Old Sol Survivor Stock. In 2017 we were not able to bring Caucasian nucs, due to bad weather and a late season, but this year we are bringing both options: Caucasian and Survivor Stock. These nucs come in a non-returnable wooden nuc. We are currently selling some options at discounted prices (for a limited time, while supplies last). As we mentioned in a previous post, we expect to distribute the packages on April 28 and the nucs should be here on May 19. 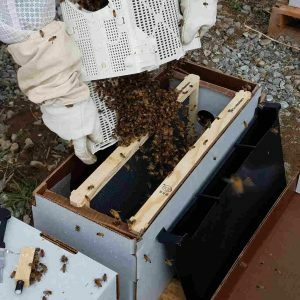 Since the nucs come with some frames that include beeswax and brood, you should get similar results by the end of the season from an early package than with a nuc that you install three weeks later. If you are just getting started with bees and still don’t know what kind of hive hardware you are going to use, we recommend you to buy a package of bees. 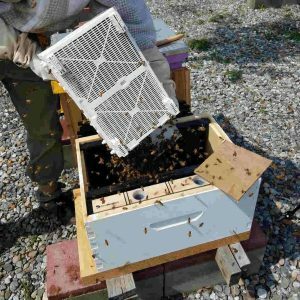 Nucs are only compatible with hives that can fit Deep Langstroth frames. Packages can be installed in any kind of hive of any shape or design. If you have any questions you can post a question on our forums.